I promised you smocking directions and smocking directions you shall have. I'm working on the top bodice of a dress. Here's a picture of quite a few rows done: You can see I've marked where the stitches are going with little pencil dots--make sure to use a washable, fabric marking kind. The best way to mark is to either use a quilting ruler and go really slowly and precisely, or you can get a piece of chipboard, spray adhere it a piece of graph paper to it, then use a Big Bite or a needle or paper piercer to put holes at regular intervals so you use a marking pen or pencil in each hole. I marked mine at 1/4 inch, which is pretty small, but makes a very delicate look. You want to mark in straight rows up and down. The honeycomb effect comes in the stitching, not the marking. You need about 2-3 times the length of your finished piece (you don't need to make the template as big as the area you need marked, just move your template around, lining up the holes along the edge with the dots you already marked). Mark it all at once, or you will be not happy when you try to mark over all those gathers. I tried it, not the best idea. Over mark, you can always wash out your fabric marker. 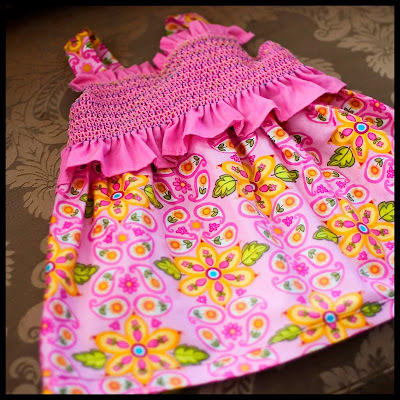 Or, you can do this the easy way and smock a piece of fabric with swiss dots. No marking required. They also sell smocking plates for more intricate and complicated designs. If you want a ruffle on the top, it's a good idea to hem it before you start smocking. Which I did in my piece, because I didn't the first time I tried it. Not good. See, I told you I did all the hard work. Disclaimer: I'm not an expert, total novice, so if someone out there knows how to do it better than I do, feel free to chime in if I've done anything wrong. 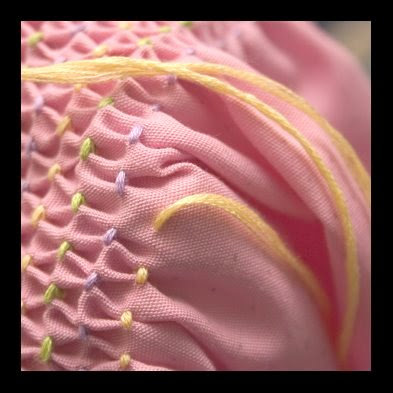 Please note that smocking does not result in a finished product that stretches, so be aware when planning your finished product. Ok, now for the actual stitch. It's really easy. Pick a color of embroidery floss that compliments your fabric for a stunning look. I have picked three different colors for this bodice. Thread your needle. 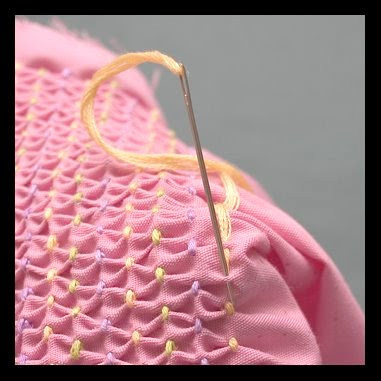 Put your needle back through the top dot, in the farthest hole, then come up a little to the top of the next dot. Pull needle through and you're back to step one. When you're done with a row, tie off in a square knot on the back and start at beginning. In summary, a diagram: The numbers indicate where the needle goes through. Pretend 1 and 4 (and 3 and 6) are on top of each other. You can see that on the 2nd row, you leave the first and last dot unworked (and for every other row after that). Now, one thing I should mention. These directions are for switching colors every row, but if you're doing all the same color, I've got another diagram to help you, with just a slight difference for efficiency from the first one. Everything is the same, except that instead of going to the next stitch in the first row, skip down a row, work the stitch, then back up to original row. Once I finished, I made my smocked piece into this dress. I hate that I made it a bit too small and she never wore it. I guess that means there is more smocking in my near future. That is beautiful. I have always wanted to learn how to smock. I might have to give this a try. 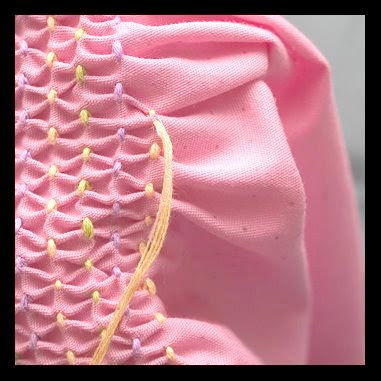 Wow -- I *love* smocking!!! You are very talented! WOW, this is STUNNING! I wish I was brave enough to try it. Love the finished look! Thank you! My Mom made my First Communion dress in the early 80s. Both my sisters wore it and Mom smocked a new row for each of us. My daughter (only granddaughter now and in the foreseeable future) will be making her First Communion next year and the dress is already too small on her. I was thinking of trying it myself. This tutorial is great! wow- amazing! 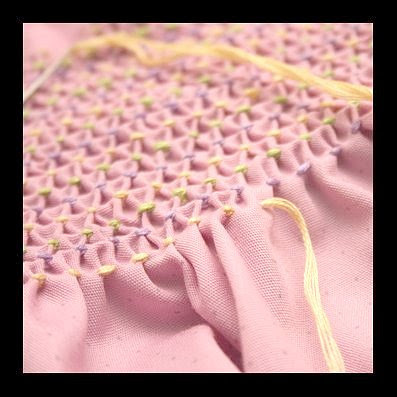 I found you on One Pretty Thing and I'm so excited to try this...I'm not a girl of precision, so we'll see how it goes- but I live in the south and smocking is all the rage down here! Lovely! 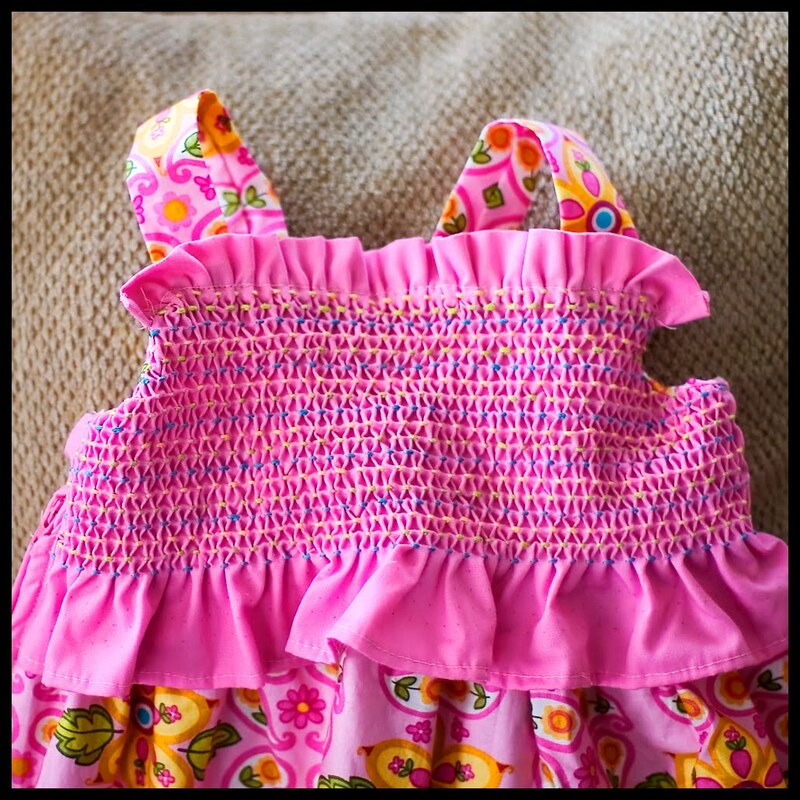 Am I correct in saying that the smocking ends up stretchy? 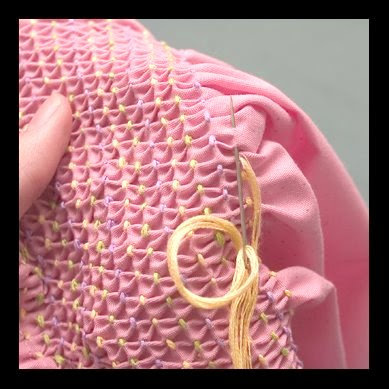 If not, would you have to use elasticky thread as opposed to embroidery floss? GreenStocking--You are right. Embroidery floss does not leave it stretchy, but elastic would. I use the iron-on dots when I have a small area to pleat and not worth the bother of the pleater. Thank you sooooooo much. 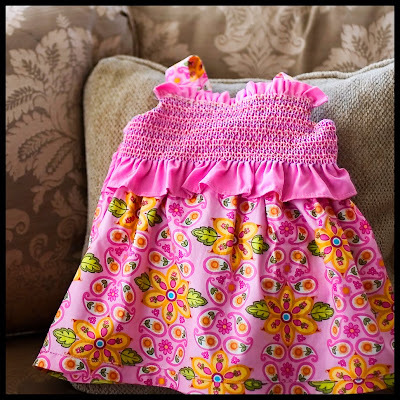 I had started a dress for my daughter but could not complete it. Now with your tutorial i hope to finish it. Will send you a pic!! This is such an awesome tutorial! I would love to publish it for you on FaveCrafts.com! We have a lot of readers who are looking for projects just like this. Let me know if you’re interested!